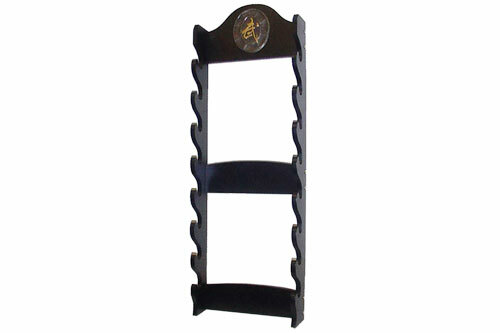 This wooden wall hanging stand is a great way to display any 8 samurai Katana, Wakazashi, and Tanto swords. Display all of your prized Samurai swords at once! Samurai swords should be prominently displayed, as they are not only examples of supreme sword construction but are also intrinsic works of art. This lovely wall display is capable of displaying up to 8 Samurai swords. Each vertical stand towers 39" tall and is solid hardwood constructed and accented with a cast metal Asian medallion. This is terrific way to show off the best swords from your collection! 3 1/2" deep. 13" wide.